Site stewards completing a site visit form. This is a portion of a larger map that shows the locations of previous workshops. The California Archaeological Site Stewardship Program (CASSP) is a statewide program, directed by the Society for California Archaeology. CASSP volunteers regularly visit assigned sites on public lands and report on their conditions to their local coordinating archaeologist, who works for the land management agency responsible for the sites. By regularly monitoring sites, problems are detected early, when they can more easily be corrected. 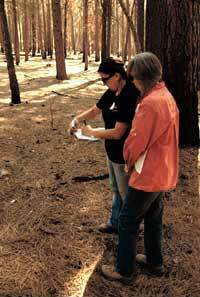 Volunteers attend a two-day training workshop before they become site stewards. Workshop participants who decide to become volunteer site stewards work in their local areas, supervised by a professional archaeologist who is employed by the land management agency responsible for the sites. CASSP volunteers can expect to make about one site visit (4 to 8 hours) a month. The agency archaeologist consults with the volunteer to make the site assignments and set frequency of visits, and answers questions about cultural resources and agency procedures and requirements. All CASSP volunteer site stewards sign an agreement of confidentiality which states that they will not reveal specific site location information. You can receive e-mail announcements about CASSP events by subscribing to the CASSP listserv. To subscribe, send a blank e-mail message to cassp-events-subscribe@yahoogroups.com. The Society for California Archaeology started CASSP in 1999. 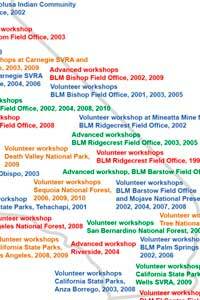 Since then, approximately 1,200 people have participated in CASSP workshops at locations all across California. In 2002, CASSP received the Governor's Historic Preservation Award. The SCA committee on CASSP is chaired by Beth and Chris Padon. For more information, please contact them by e-mail (below) or phone (562-595-3995).